We can’t wait to help you get back to where you want to be. Thank you for choosing Deep River Rehabilitation! As a trusted source for outpatient physical therapy in Rockingham County, we can help you recover and rehabilitate from orthopaedic problems, sports injuries or walking/balance problems. Our dedicated staff’s goal is to help reduce your pain or symptoms and perform the activities you want. To learn more about the Deep River Rehabilitation – Eden story visit our About Us page. Please look below for information designed to make your introduction to Deep River Rehabilitation – Eden as positive as possible. 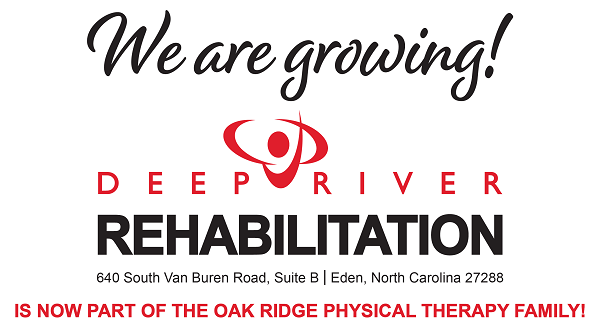 Be sure to check out our first visit “walkthrough” below, which will help to guide you step-by-step through your initial visit with us here at Deep River Rehabilitation – Eden. Click here to download our Patient Registration Packet. Fill this out in the comfort of your own home and bring it in at your first visit to expedite your care. Go to our location page for a map and Google Maps directions to our convenient Eden facility. Visit our Frequently Asked Questions page for all sorts of information about Deep River Rehabilitation in Eden. Scheduling your initial evaluation may be accomplished over the phone, via the internet or in person, with appointments made within 48 hours. Most patients conveniently print off our new patient paperwork from our website and fill it out at home. If you are unable to do this, we have forms at the facility. When you arrive at Deep River Rehabilitation, you will check-in at the front desk, found immediately in front of you when you arrive at our facility. There are some chairs available for you, if there is a short wait. If you’ve already downloaded your registration materials and filled them out ahead of time, you can hand them to the reception staff and speed up the initial registration process significantly. If not, no worries! We will provide you with the registration materials for you to fill out and then get you on your way to recovery as soon as we can. At your first visit, your NC licensed physical therapist will perform an evaluation. This evaluation typically includes taking a relevant history, an assessment of your body posture, muscle performance, range of motion, strength, flexibility, joint mobility, and the painful area/joint or muscle. An assessment of your functional abilities is also usually performed. The physical therapist will explain your problem and pathology, educate you in some home exercises and possibly initiate in clinic treatment. The physical therapist then develops a plan of care using treatment techniques that promote your ability to move, reduce pain, restore function, and prevent disability. The physical therapist and the patient work side-by-side to set the goals of the treatment plan. The therapist will also explain the recommended frequency of physical therapy visits at the facility. Therapeutic exercise, manual mobilization treatments and functional training are the cornerstones of our treatment. The individualized, “hands on” approach that characterizes our care is very important. Treatments may also include other techniques such as electrotherapy, ultrasound (high-frequency waves that produce heat), hot packs, iontophoresis and icepacks. Commonly patients attend physical therapy 2x/week for 3-4 weeks, but this depends upon many factors. Future appointments will be made after your initial evaluation. Things to bring to your first visit: referral if you have one, loose fitting clothes (workout-type) comfortable for exercise that will allow your physical therapist to be able to examine the area to be treated, insurance card, your filled out patient forms.